What is the guestroom energy dilemma? The guestroom energy dilemma goes like this. How do you get a paying hotel guest to consider energy management? Answer: Now, you don’t have to. A report recently published by Navigant Research# provided an interesting insight into a new area of hotel technology called guestroom energy management systems or GrEMS. This new and exciting technology aims to solve an increasing problem faced by many hoteliers. How do you prevent rising energy costs from impacting the bottom line without effecting guest comfort? 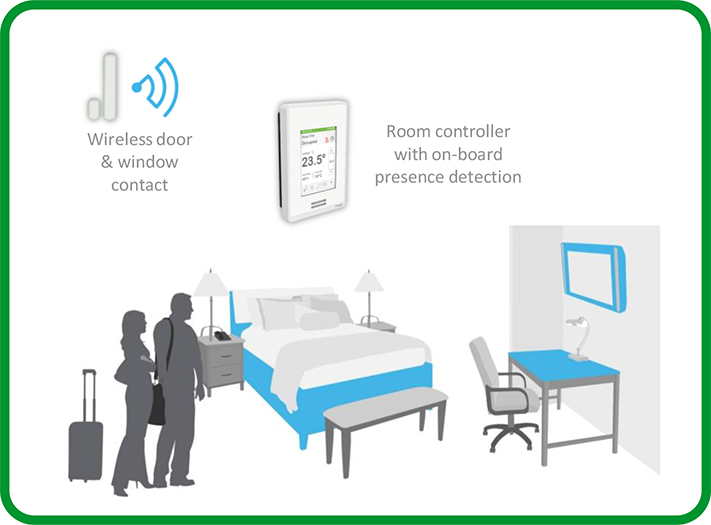 Guestroom energy management systems (GrEMS) use a combination of advanced sensors and intelligent controllers to optimise room conditions based on real-time occupancy patterns. In simple terms, the technology saves money by intelligently controlling the heating, cooling and lighting inside the guestroom. According to the research, trial data showed that the technology can consistently give a payback of 2 years without impacting guest comfort. Obviously, these figures are dependent on local variables such as energy prices, equipment used and the external environment, but these initial findings seem very promising. These systems are not only restricted to new build projects. There also appears to be a big opportunity for existing hotels with the report showing that fewer than 1 in 20 hotels have any type of GrEMS installed. Many GrEMS vendors have incorporated wireless connectivity to reduce install costs and provide an improved return on investment for this type of opportunity. So, why is this technology not everywhere already? According to the report, there appears to be no single reason why take up rates are low. However, a main barrier to adoption, as with most new innovation, appears to be a lack of evidence and confidence with the Hoteliers. This effect may be further exaggerated due to those who installed first generation occupancy detection systems in the 90’s that were notoriously bad for the guest comfort and led to complaints. Understandably, early adopters of the older systems may now be pessimistic toward new energy saving technology in the market and need additional reassurance. To get market acceptance vendors need to improve how they promote and demonstrate the benefits of these systems so that hotel owners and operators can see the value in this technology. If vendors start to provide data and evidence to support these systems, then I am sure this will help hotels to secure funds for what could be a great investment. Do you already have, or plan to install a GrEMS in the coming year? Let us know in the comments below. Thank you for this comment. Occupancy detection mechanisms used vary between manufacturers. Typically they use a mixture of inputs from motion sensors, door contact switches and reservation systems. These inputs are used in conjunction with a carefully selected control algorithm to determine the room occupancy state. Just using sound or movement alone will not typically be suitable for a hotel application as it could disable or setback the room when someone is asleep or in the bathroom. System algorithms also need to take into account dual occupancy scenarios. Movement sensors can come with different levels of sensitivity with passive infrared (PIR) being less sensitive than microwave sensors for example. These also need to be selected correctly according to the application. Sound is not typically used for occupancy detection as you could get false readings from sounds originating outside of the guest room. I hope this is helpful. Eight steps to maximize the ROI of a hotel guestroom management system Energy efficiency – the new mark for hotel excellence and a real ROI Hotel Genius A “connected” hotel not only enhances your guests’ stay…it delivers a virtually immediate ROI. Best part is…it’s easier than you might think.